This Saturday evening, the All-Campus Band and Lavender Jazz will be the first of the Goshen College music ensembles to perform their spring concert. One thing that makes the campus band unique is the opportunity it gives winds and percussion to be featured in pieces, rather than sharing the spotlight with stringed instruments in a traditional orchestra. This ensemble is led by José Rocha, associate professor of music, and features a mix of students, GC faculty and community members that all commit to rehearsing on Monday evenings. Rocha has been directing this ensemble since joining the Goshen community in 2015. “I enjoy the commitment of the band members. We are a small ensemble, but I like to think of it as lean but mighty,” Rocha said. He also mentioned that the size of the group holds each musician accountable and provides opportunities for almost every instrument to have a featured solo. Kenan Bitikofer, a clarinet player, appreciates the challenge and fulfillment of playing in this ensemble. It “paints an epic picture using potent melodies and energetic accompaniment lines. Only the heartless could fail to shed a tear as we commemorate the passing of those mystical beasts,” Bitikofer said. Besides Sauder Hall, the All-Campus Band performed at basketball games this year. The band will also be the ensemble performing for the commencement ceremony on April 30. The second half of this concert will feature Lavender Jazz, led by Chris French, adjunct professor of music. This performance includes both older and more modern pieces and embraces a variety of styles including swing, Latin, funk and free-form jazz. The piece Jacob Penner, a senior, looks forward to the most is “The Lady is a Tramp,” arranged by Tony Bennett and Lady Gaga, and will feature vocalists Maggie Weaver and Galed Krisjayanta, seniors. Penner also looks forward to “Round Midnight,” in which he will be featured as a soloist on alto saxophone. “It’s a jazz standard with some hip, mysterious chords that are lots of fun to play with, and it conjures up the classic image in jazz of the smoky, dimly lit bar with music coming from the corner,” Penner said. Another feature of this portion of the concert will be “Luck Be a Lady” by Frank Loesser, arranged by French horn player Reid Wegrecki, a junior. Wegrecki had never written or arranged anything for a jazz ensemble before, but enjoyed the experience and plans to continue writing and arranging music as part of her career after graduation. A few of her original compositions were featured in her composition recital last Friday. 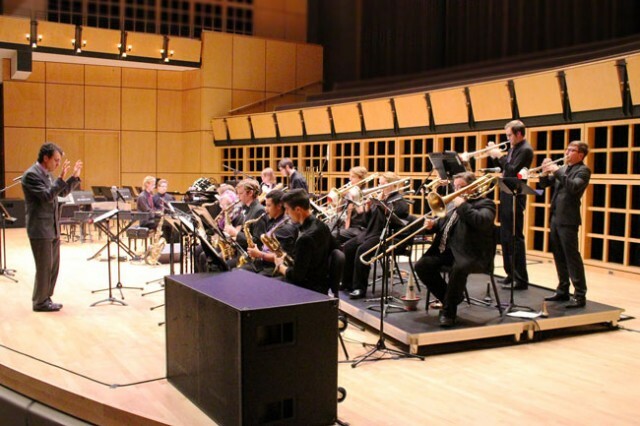 Music ensembles such as these provide opportunities for students to showcase their talents and make connections with other students and faculty on campus, both musically and socially. The culmination of these musicians’ hard work can be heard this Saturday, March 25 at 7:30 p.m. in Sauder Concert Hall. Tickets are $7 for adults, $5 for students and GC faculty, staff and students are free with ID.